Are you following along with my Focused in '17: Best Year EVER challenges? 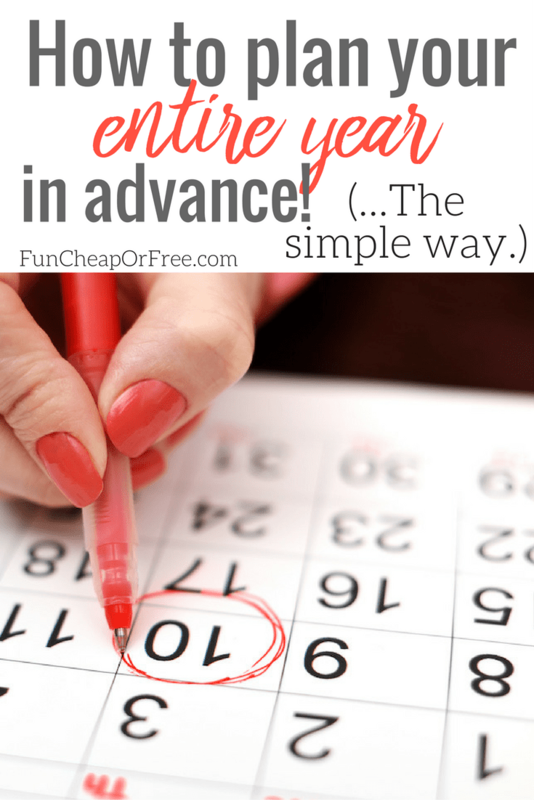 The first one is my favorite…plan your ENTIRE YEAR in advance! A few years ago I showed Bubba and I planning our entire year in advance. It basically broke the internet! You were so curious about how we do it, why, and how the heck we get it to work! I did THIS POST that explained it, but haven't really talked about it since. We thought we'd refresh your brains and show you how we did it, and how you can make it work for you too! We made a video last night that explains it in full detail, so you can follow along with my free Focused in '17: Best Year EVER program! First, watch the video, then see below for the printable and tips! Not as bad as you would think, right?? 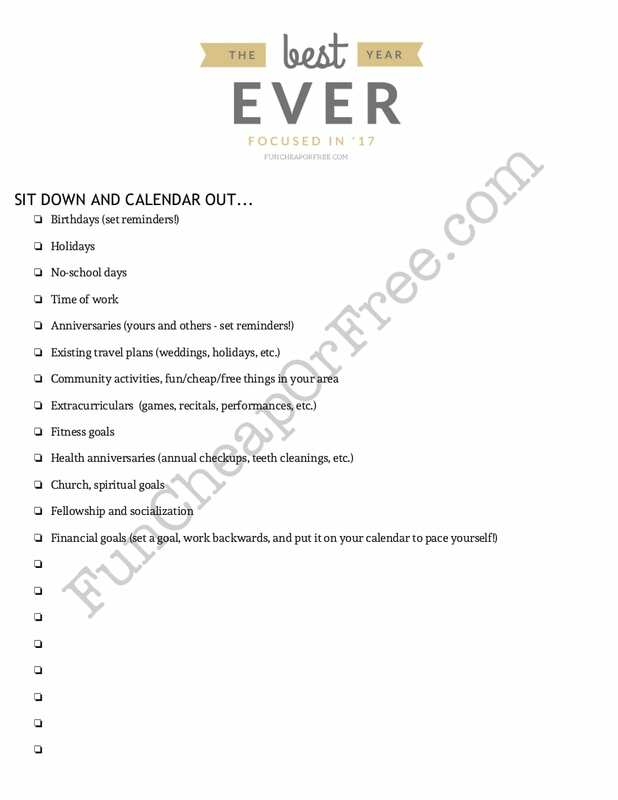 As promised, I made a quick printable for you to print out and follow along with as you plan out your year. Get the free printable HERE. Again, get this printable HERE, and follow along with the rest of the Focused in '17: Best Year EVER challenges by heading HERE. Also don’t know what I would do without my Google Calendar App! I even import other calendars to it such as our local school calendar, as you suggested. What a life saver! I’m stealing your theme , “Simplify”. I plan to expand that by also downsizing and decluttering. I’ve got my budget simplified already thanks to you and your envelope system help. Thank you so much and I’m glad you’re not, “going anywhere”. Thank you for this video. Bubba is clearly not feeling well. Glad he joined in though. My husband is an active participant in our family’s planning and day to day life as well. I could not imagine a life without an equal partner. Yes, planning is crucial. We booked Disneyworld a year in advance and I made month payments. That was the best vacation ever! We showed up and owed nothing. 😉 Love your enthusiasm. You kill me. 🙂 I love it! Can’t wait to get started on my new 2017! Financial goals, family plans – our baby is GRADUATING and we will be empty nesters! EEEK! When you use google calendar, do you sync it with your iPhone calendar or do you have the iPhone calendar AND the google calendar app? I need to know what Mory is sitting in…I need one of those!! Haha right?? I got it as a black friday Amazon steal a few babies ago and would die without it! Here it is: http://amzn.to/2j2ixd1. I got mine for about $60, they aren’t cheap! But we use it every day, several times per day, and when we travel. I have a very detailed Excel spreadsheet (in Google Docs) for our financial year, so I can make sure that we have enough in checking at any given time for all bills coming out and so we can ‘try’ to stick to the budget. We also use Google Calendar to plan, but I got some great ideas from your video of what else to add to it. I love the idea of swapping Anniversary/Valentine’s Day celebration planning with my husband. Our son’s birthday is on Valentine’s Day, so I think we will just switch off years for Anniversary plans & gifts. One thing I’ve done that correlates with this is at the beginning of each month, especially around the holidays and the summer, I write a list of activities I WANT to do or hope to do and then I have an idea and budget each month for different activities. Some months we do a lot and others we don’t. I’m really hoping to tackle 2017 and get things under control so I’m grateful you’re doing this! Please please show how you use your paper calendar as a to do list. Hi! I love your methods! Im highly organized and last night I asked my husband to watch 3 of your videos with me for him to see how I wish I could live (hes a mess). He loved it too and we’re working on planing our year. Is there a way to set up a calendar in Google Calendar that has them all recurring every year so that we dont have to click “recur yearly 100 times? Thanks for all your helpful tips! Planning date nights and family fun has been a game changer for our family! It took a bit of nagging but I finally got my husband to request his work leave for the whole year in January! And bagged a little more until it got approved. Now we know when our family camping trips will be and our moments to stop and take some time out. I am calmer now and handle his long work hours better and we can prepare better financially. Not to try and start planning date nights in advance! This is a fantastic idea! I used to do this for work, bit have never used this technique in my personal planning. Will definitely be doing this from now on! This is a great idea! I usually do a few months but why not the whole year! Thanks for the printable! Great ideas. I am a super planner as well but learned a couple new tricks. Thank you! I love this! It is so healthy to talk about things before they happen to lesson the pressure. I think it will be a game changer for my husband and me to know who is in charge of anniversary each year! This is so smart! No more surprise events popping up! I did this for the first time this year (as best I could!) and it’s already been so awesome!! I’ve been wanting to do this. But with my husband’s schedule, I’m just not sure how well it would work for us. This helped me up our game a little but better with our calendar, thank you!